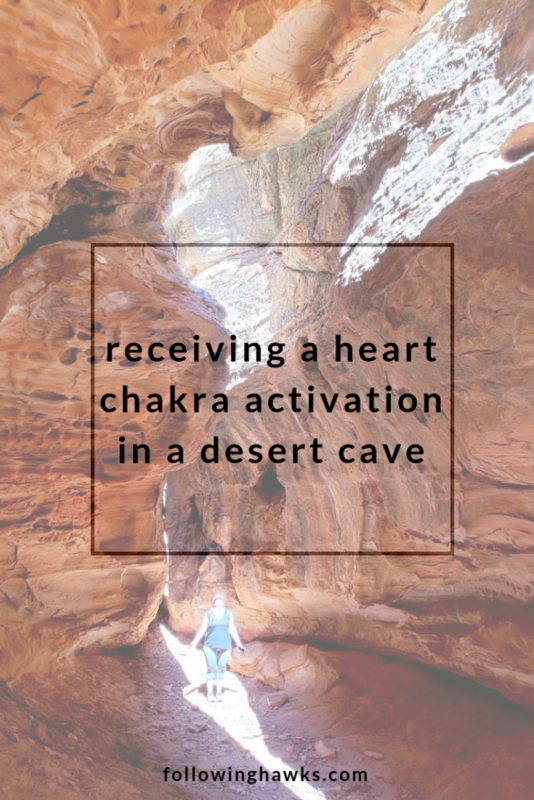 Last week, I drove from Montana to Nevada to meet up with my friend and fellow healer Amar. After staying with us for a month while she’s been traveling in her RV, she’s been in Las Vegas for the past month and during that time, we both knew that we were going to meet back up soon. But we weren’t sure when or how so we just kind of waited to see what messages we received. It didn’t take long for the details to become clear. Two other blog readers, Elias and Kaivan, were headed to Vegas at the end of the month and wanted to meet up. The problem was, I was being told by my guides that I was absolutely NOT to go to Las Vegas. The energy was not good for me there and they didn’t want me setting foot in that city. They told me to meet everyone in Mesquite, an hour or so east. They also repeatedly told me that our work would be “under the stars” so I knew we needed to camp. And it needed to be dark. We ultimately found only one campground in about a 100-mile radius that accepted reservations. It was 25 miles south of Mesquite, but it took us two hours of driving over narrow, bumpy BLM roads to reach it. To call it remote would be an understatement. But I nearly gasped when I got out of my car. The views of the desert plateau were expansive and jaw-dropping. It was worth every pothole we hit to get there. We didn’t exactly know what we would be doing in this place or why we’d been called there. It was a little too strange that there were no other campgrounds with availability in such a wide area. But the story began to unfold the moment I put my car in park. I was immediately greeted by the volunteer camp host for the weekend, Judy. She explained that her great grandfather had purchased these 200+ acres in 1910 and that her large family had gone to great lengths to hold onto it over the generations. Her brother was now the owner and had spent the last two years rehabbing it into a campground so that other people could enjoy it and they had just opened it a few months back. Unfortunately, he’d recently been very sick so she had been making the six hour drive between her home and the campground to take care of the place and the guests. And she immediately told me what a deep spiritual connection her family had to this land. Mmhmm. And so it began. We had arrived a few hours later than anticipated so we had to hustle a bit to setup camp and make dinner before it got too late and too cold. But once we were done with our chores, we settled into the “rock house” – a small lodge that Judy’s uncle and cousin built by hand, to begin our work for the weekend and receive our instructions. Amar and I had tried repeatedly in the week or two before the trip to get details about what we would be doing, and we were both told that we’d receive the messages once we arrived. One more blog reader, Kristi, felt called to join us at the last minute after I’d sent an email inviting others to come along for the journey, explaining our plans and our lack of real knowledge about what we’d be doing. So now, the five of us settled at the dining table with our notebooks and pens to find out. I passed around some of my favorite essential oils for channeling and journeying and everyone picked one that they wanted to work with. After putting a drop or two in our hands and inhaling the potent plants, I led the group in a shamanic journey to meet the keeper of the land and ask for any information or instructions for the weekend. When we concluded our journey, we each shared the details we had seen, experienced or heard. Each person received different pieces of information, but there were also quite a few similarities. Ultimately, every spirit that we met that evening, either as a group or individually, ended up interacting with us over the course of our stay there. 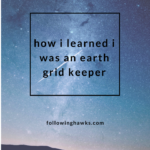 Each day, we were given more details about what our tasks were but it’s way too much to share in one blog post so I’ll have to share one story at a time. On that first night, Elias met a giant yeti in his journey who asked him to follow him to a cave. He had to crouch down to get into the cave and waved for him to come inside. He pointed towards some kind of monument in the middle of the cave and Elias got the sense that he was to put a stone or some kind of offering there. When he shared this story with us, the rest of us were able to tune into the cave as well. Amar picked up that it had a green, heart chakra vibration and I could see the shape of the opening. But how were we supposed to find it? 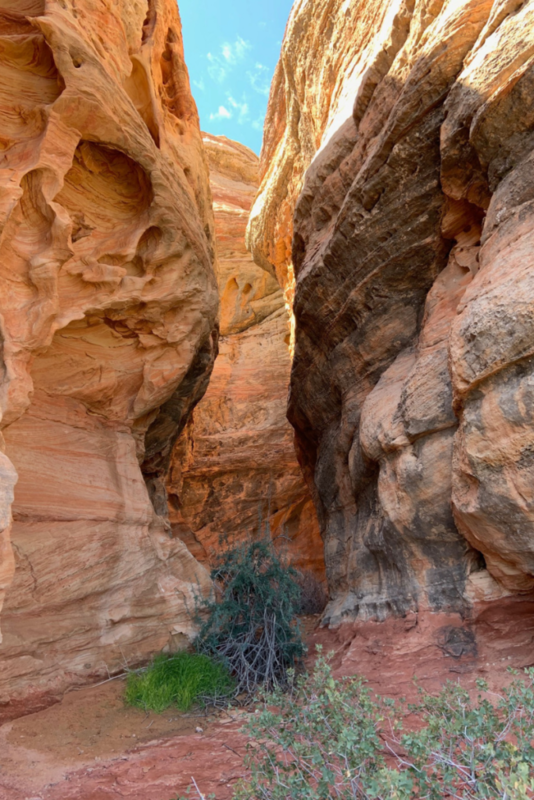 We were smack in the middle of the 300,000 acre Gold Butte National Monument. It was going to be like finding a needle in a haystack. Elias and Kristi also mentioned a lion or tiger energy. And when they mentioned that, I scribbled on my notebook…the lion/tiger is in the earth. Collectively, we’d also connected with a young woman in a prairie-style dress who said she’d died on the land 127 years ago and a very stoic old man with a white beard. I received the message that the spirits present wanted to be in ceremony with us. The five of us that were gathered were from a variety of backgrounds, cultures and faiths . They wanted us to join hands, join our energy and call the spirits forward. I was told that a new dream is coming into being on this land and that we were the first ones to come together there as a group in this way. There is deep healing energy available in this place and it was to be our job to call the energy of others who need to receive this healing. They also said that this land is a difficult place to reach by design. Not everyone can get there, but those who resonate with the energy there can find it. After comparing notes, we felt like none of us met with any spirit that we believed to be the keeper of the land. Apparently it wasn’t time yet. We went to bed that night after spending some time looking through the telescope at the full moon, excited about what would happen the next day. But as it turned out, none of us slept that well, and it wasn’t out of excitement. I slept in my tent, Kristi in the back of her SUV, and Amar, Elias and Kaivan were all in the RV. When we compared notes in the morning, we’d each had some unusual experiences. Amar woke up very suddenly in the middle of the night feeling like she couldn’t breathe and actually tumbled out of the loft bed in a bit of a panic. When she was fully awake, she realized that the stoic man was standing outside the RV, just looking in the window. The yeti was also outside, walking back and forth between the RV and my tent. She got the impression that the yeti was anxious for us to do what we came for and had to tell him to hold his horses until the sun was up. Kristi saw the old man too. He stood outside her car and looked into her window as well. But he didn’t seem intimidating or frightening at all. He was just…watching. Meanwhile, I had woken up a few times because the moon was SO bright that it felt like there was a flashlight shining into my tent. So I really couldn’t be sure if I was awake or asleep when I suddenly felt my tent being dragged across the ground. Although it didn’t feel like it was actually ON the ground. It was sliding very fast, like it was on ice. I almost shouted out, thinking that someone was playing a trick on me. And then realized that I had been asleep and my tent was still staked to the ground. But there’s no way that was a dream. I wasn’t really sure what had just happened so I wrapped myself up tighter in my blanket and put myself in a protective bubble of light and tried to go back to sleep. But I couldn’t. While laying there, listening to the quiet, I realized there was something VERY large standing outside my tent. It had two giant hairy legs. Its waist was as high as the top of the tent, but I couldn’t sense anything above that. I now realize that it was the yeti protecting me. But in the middle of the night haze, I couldn’t quite put all of the pieces together in my brain. At some point I nodded back off and didn’t wake back up until morning. 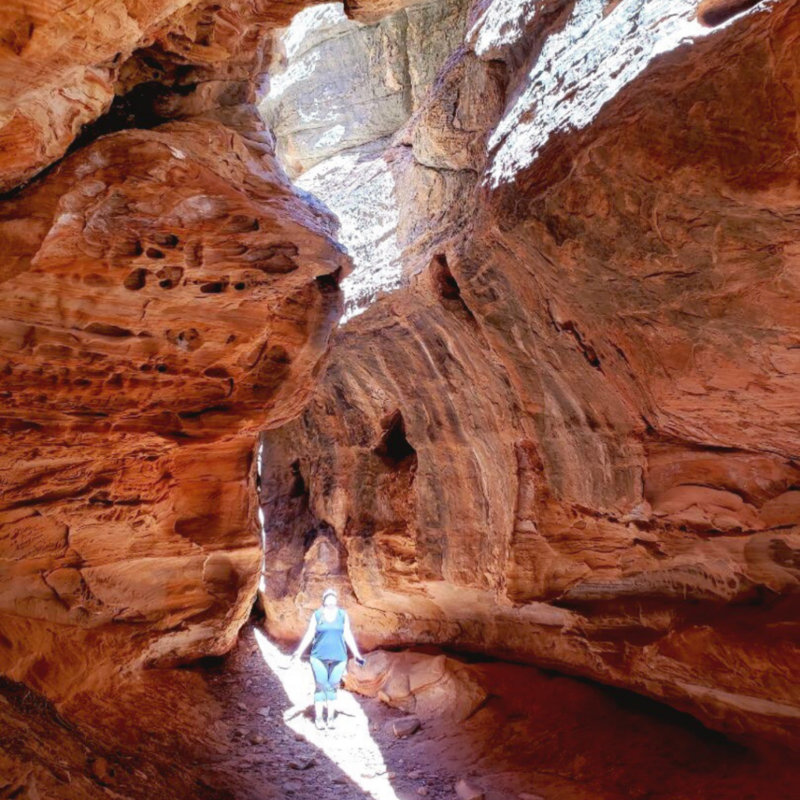 As I was puttering around camp, making some tea and enjoying the warm desert sun, I saw Judy and asked her if she knew about a cave we could visit. You mean the Ice Caves? She said. I had to admit that I had no idea what cave I was asking about. But if the Ice Caves were nearby, we wanted to go. She called her cousin who seems to be the family oracle on how to find things in the desert. He texted us the GPS coordinates of the cave and described exactly how to get there. It was only a few miles away by car he told us, and the hike in was easy. You just had to know where you were going and what to look for. 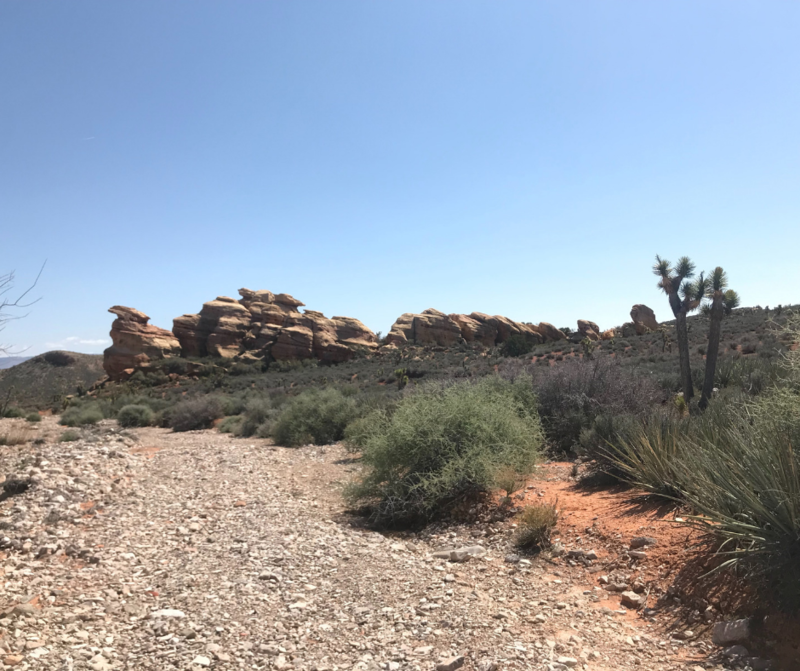 After breakfast, we piled into two vehicles with a vague idea of what we were looking for and headed deeper into the desert. We crossed the Arizona state line, went up and over a small hill and when we turned a corner, the giant rock formation suddenly came into view. I wan’t sure when I first saw it if that’s where we were headed but if it wasn’t, that’s where I WANTED to go. It was calling us, for sure. We parked the cars just off the road at the wash, as instructed, and started walking towards the rocks. We all started receiving information as we walked closer. I asked for permission to visit and it was granted. An ancestor spirit told me that this was the true heart of the land in this area and they wanted to share it with us. I felt like I was being pulled towards the cave by my heart. Kristi was feeling an overwhelming amount of emotion and we all heard or felt the spirits welcoming us to this place. As we reached the rock formation, and we started climbing up the trail, we walked slowly. The energy was so strong and loving. 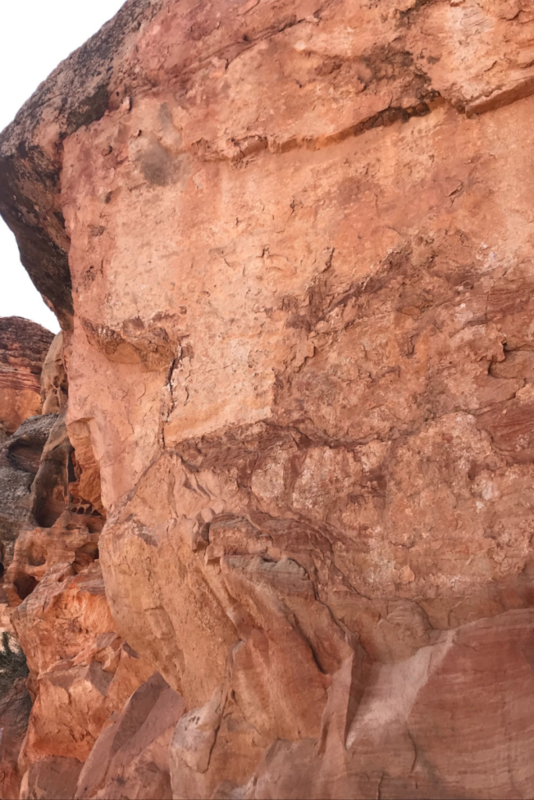 Kaivan, who is new to energy work walked up and placed his hand on the rocks and realized that he could feel the energy buzzing through his body. He hadn’t had that experience before and was excited to actually feel it. We each walked along the trail at our own pace and were just slightly spread out when Amar shouted from behind us to look at a face profile in the side of the rock. We all stopped to look and could see it clearly so I picked up my phone to take a photo. I didn’t quite have the right angle so I took a few steps to the side, held my camera up and immediately said OH MY GOD! Was a giant lion face. It wasn’t totally visible with the naked eye, but when I took a photo, it was the only thing I could see. I mean…whoa. That’s a cat face. I remembered that there was a lion/tiger connection from our journey the previous night and also that Kristi had emailed me the prior week to say that she had been journeying in one of the portals on my property and that a lion had repeatedly come to sit with her in meditation, but never gave her any messages. And there he was, in the earth, as I’d heard the night before. Guiding our path to the cave. We continued on the trail around the rocks until we came to the slightly hidden opening on the back side. You really wouldn’t know this place exists at all from a distance, and then there is a large shrub growing in the cave opening that you have to kind of duck under and shimmy around. Elias sent me this photo. It’s hard to grasp the scale – that shrub is nearly as tall as I am. When I walked inside and turned the corner, I couldn’t believe it. 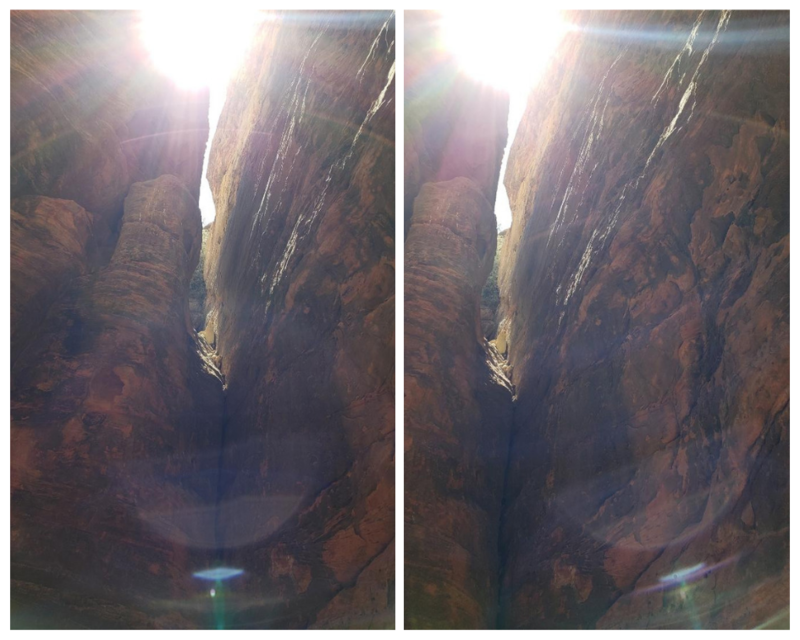 Not only were the red rocks stunningly beautiful, there was a column of light descending right into the back middle section of the cave. I had seen a vision of this in meditation the prior week and was told that it would be healing and activating and that it would assist in clearing karma. We each took turns standing in the sunbeam, absorbing the light codes straight into our hearts. I swear…I don’t think I’ll ever not be blown away by spirit and this magical world that we live in. Anyhow, we each took a few minutes to walk around and enjoy the beautiful space before we intuitively knew it was time to start tuning in. We spread out, each found a place to sit and took out our notebooks. The spirits joined us, in ceremony, as they had requested during our journey. The yeti stood in the doorway to the cave – his job to get us to this place was complete. I heard that they had all gathered here to wait for us. As we sat quietly, we all began to realize that there was a small portal of energy floating above us in the middle of the cave. But it was shaped differently than most we’d seen. This was in the shape of a merkaba, or Star of David. We were “under a star”. As per usual, I had taken the spiritual message of our work being “under the stars” a bit too literal. But whatever… it clearly worked to get us where we needed to be. And it was green as Amar had sensed. It was spinning slowly at first, but as we tuned into it and shared a few chants, it began spinning VERY fast. Kristi connected with Jin-Ra who now identified himself as the keeper of the land there. He asked us to release anything that burdened us and to leave it behind in the cave. As we each began releasing our own personal burdens, we were overcome with emotion. Lots of tears were shed as we felt the deep connection and love from the spirits and energies in this place. I was told that the portal is incredibly pure. These spirits have been caring for it and protecting it for many generations. But they wanted us to experience this pure, love energy so that we can carry it back out into the world and share it. They asked that we help to be stewards of this energy. And told us that we are all forgiven and cleansed. After this collective healing, the spirits began dancing for us in celebration and to cleanse the energy we left behind. We slowly began to stand up and realized that we needed to leave an offering. Each of us had kind of intuitively picked up a rock on our hike in and now we knew why. They needed to be left here, in the cave, to show our gratitude. 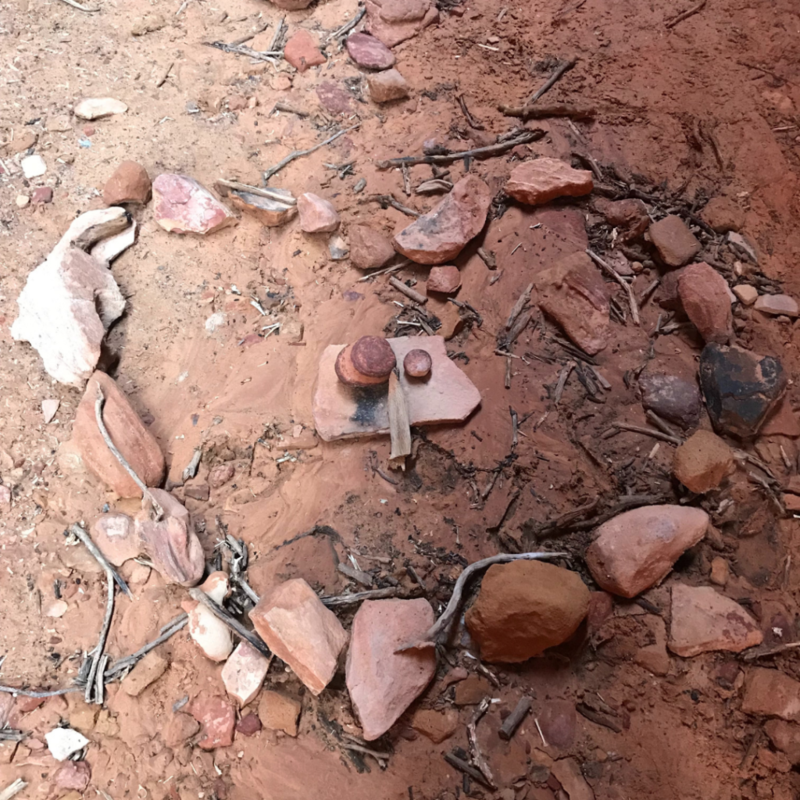 We wanted to arrange the stones in a heart shape to honor the love energy and began adding other stones to the outline and realized how many of the stones in the cave that we picked up were already heart-shaped. The love energy in this place is so strong. After our offering was complete, we decided to name this journey “the heart beneath the stars”. 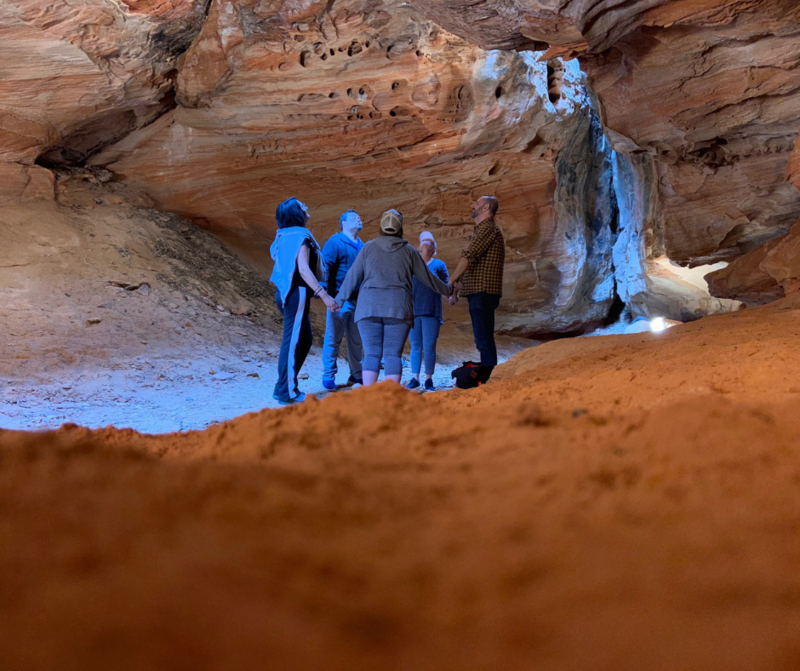 We realized when we looked at our photos that the cave had a very “female” entrance and that we’d somehow accidentally created a phallic symbol in our offering. That was not intentional, I swear. But we all laughed REALLY hard when we realized it. Even the offering is half in the light and half in the shadow. Crazy, huh? Finally, we gathered around the stones, joined hands and gave thanks to the spirits, and each other. As we gathered our things to leave, Kaivan noticed that the column of light was gone. The sun had shifted in the time we’d been inside the cave and was no longer shining in. Had we arrived at the cave at any other time than we did, we would not have seen or experienced that activating light. The spirits had guided us to the exact place and time that was needed. I don’t know why I had been worried at all. Elias sent me this photo too. I don’t even know how he pulled it off with his phone. But whoa. 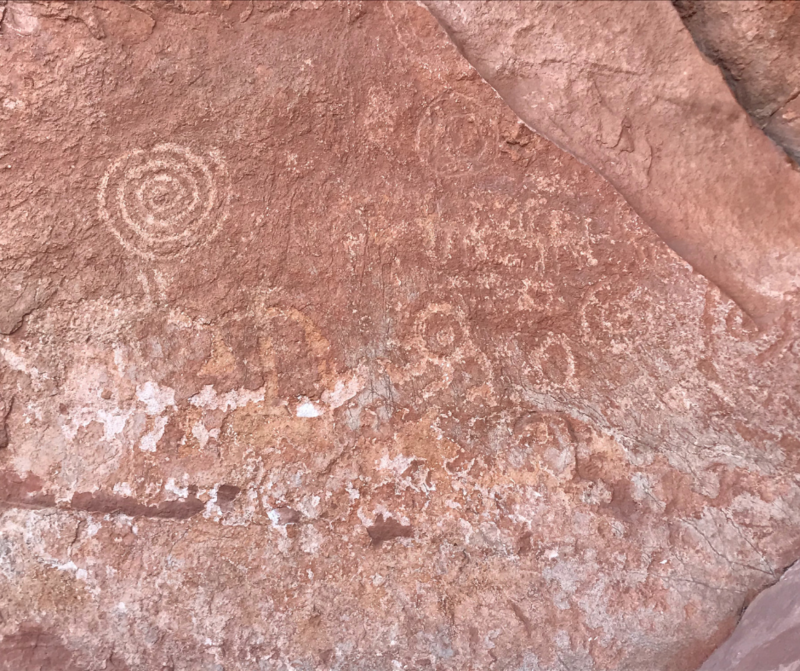 As we walked out of the cave and back around the rock formation, we found ancient petroglyph drawings in multiple places that we hadn’t seen on the way in. People have been visiting this cave for a very, very long time. We were in awe of the experience we’d just had and were just kind of floating around in this love energy. A few hours later, Elias and Kaivan left to head back to Las Vegas since Elias had work commitments in town the next morning. After they left, Kristi and Amar and I were reviewing the photos we’d all taken. This time, it was Kristi who gasped. As she was flipping through her pictures, she realized she caught something very unique. The actual image of the spinning energy in the middle of the cave. I don’t need confirmation of intuitive experiences anymore to believe them, but it sure is fun when it happens. And this all happened in the first 24 hours of our visit. I still have MORE stories to tell about the other spirits we encountered the rest of the weekend. Through another series of events and coincidences (ahem…clearly arranged by spirit), Amar ended up getting hired on to caretake this property through the end of June so I may try to make one more visit before she leaves. Send me a note if you’d like to join us and visit this campground and cave for yourself. This was an experience none of us will ever forget. And I’ll be eternally grateful for the spirits and Amar, Kristi, Elias and Kaivan who made it all possible. Whoa! I almost felt I was there with you all, how incredible! Love this! Can’t wait to visit there soon! I’ll be living on my new Camper Home by the end of the summer. This place is now on my list. Thank you for sharing!